A lot of people have a difficult time posing Mini Lops in general, but especially babies. 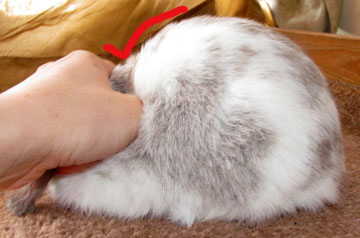 I know it can be challenging, so I thought I would write a guide to posing & evaluating your baby Mini Lop. This page focuses on evaluating your babies. 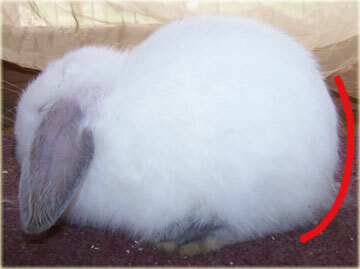 You can view the posing guide for baby Mini Lops here. I pose & evaluate my Mini Lops at 5-6 weeks old - this is when I choose who I'm keeping and the qualities/faults of the rest of the litter. Once my line matures, they look just like they did at 5-6 weeks old. Every line will be different and some may mature at slower rates. 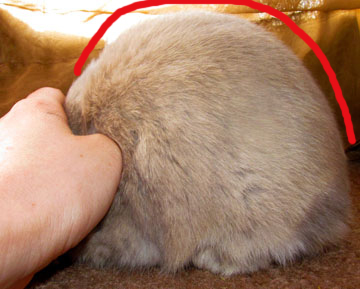 But, this is what works for my rabbitry. Some people may have others help them. And honestly, if you have a breeder in your area who is willing to give you a hands-on lesson, it would help GREATLY! I pose and evaluate all my babies by myself. I've had quite a few years experience and so it has become quite easy. The most important thing to do is to make sure the baby is posed correctly. If the baby is not posed correctly, you cannot properly evaluate their body type. Some babies will be a little tense their first time posing, so setting them on the table, petting them, letting them hop around for a minute or so, will help them loosen up. 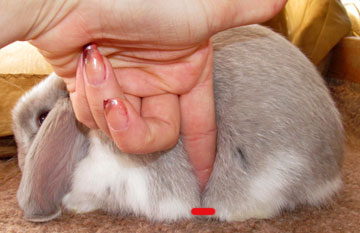 Mini Lops are to be posed flat on the table. 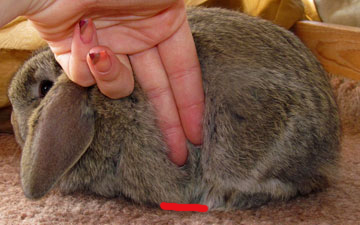 The tip of their front toes should be even with their eyes and the tip of their back toes should be even with the front of their hip. So, with all that said, let's get to posing & evaluating the babies. 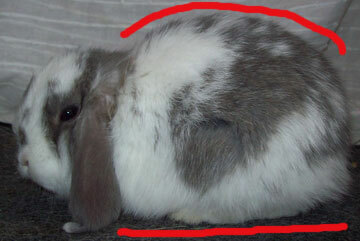 Remember you can read more on the general type of Mini Lops at the Mini Lop Type page. 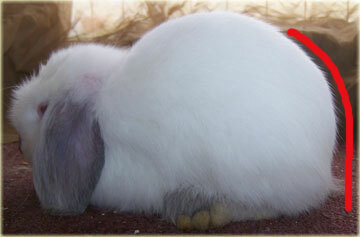 This is an example of a nicely typed baby Mini Lop. She is well balanced - has a nice rice, well rounded HQ's, is full to the table at her HQ's, has thick shoulders and is short in body. This girl is another example ofa nicely typed, well balanced baby. 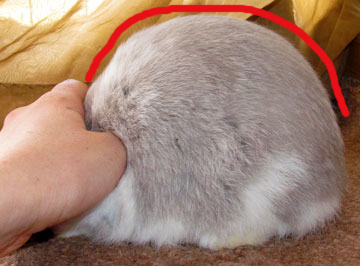 It shows the balance of a nice Mini Lop head on the well typed body. 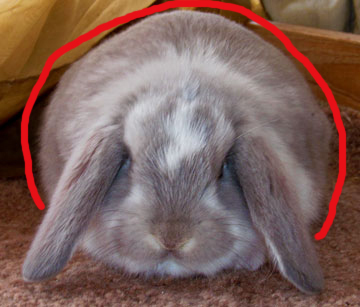 This picture shows a great example of the well balanced, well rounded, short, smooth & deep body that a Mini Lop should have. This baby is extremely deep and has a wonderful rise. 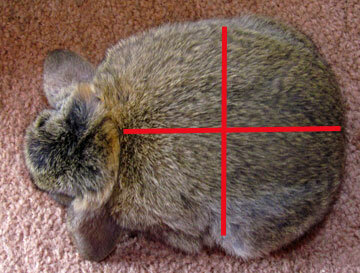 This is a view from the top - the depth and width of the animal from the top is important. 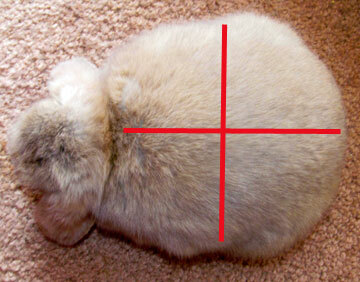 Because the Mini Lops are to be short bodied, their depth & width will typically be the same length. 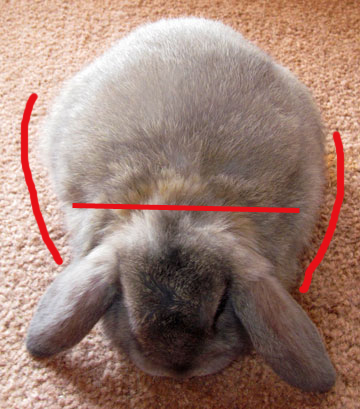 This picture shows the good width of a baby from a top/front view. 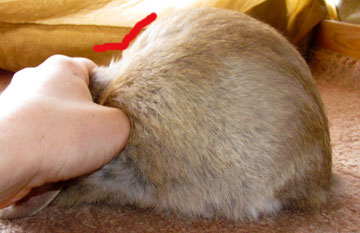 As in the picture of the depth/width to the right above, this shows how the shoulders should start at a wide base from right at the neck and extend in a round, even motion throughout the body - to a well rounded, filled hindquarters. Here is another picture from the very front of the baby to show nice width. 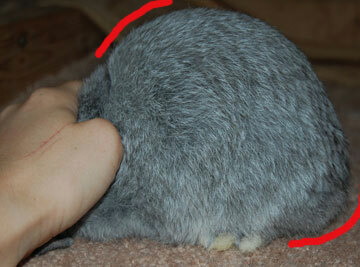 This picture shows the full hindquarters that you want a baby to have. You want a Mini Lop to have full, well rounded hindquarters down to the bottom of the table. This is another picture of the top to show the well rounded start of the baby from the shoulder throughout the body to the hindquarters. 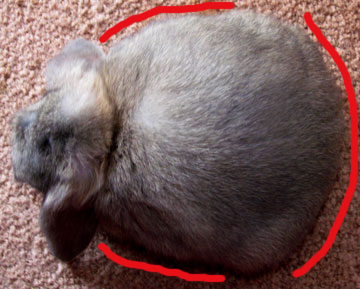 The crown of Mini Lops should be very full and prominent. 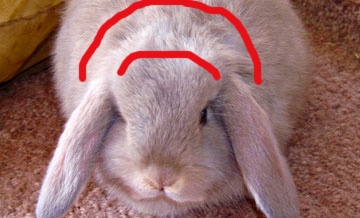 Their ears should hang easily from their crown, as in the example above. 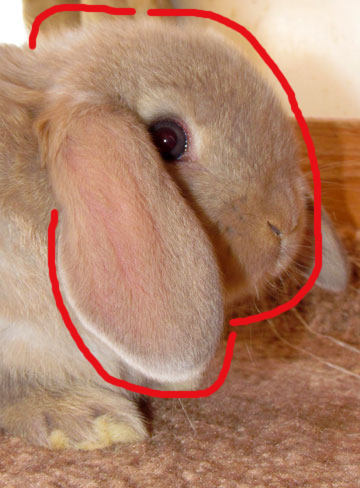 You also want nice width between the eyes and the muzzle, as this baby shows. This is another example of a nice crown, but one that is not quite as wide as the buck at left. This baby is a doe, so her crown tends to be a little narrower. Both of these babies have good crowns. 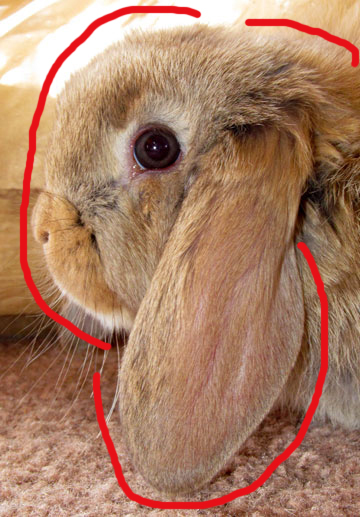 This is a view of the shape of the Mini Lop's face from the side, so you can see how full & well rounded the face should appear, with nice crown definition. 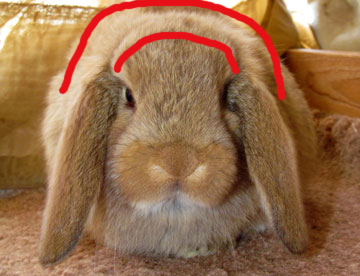 The ears should hang very well, be pointed inwards and should have a nice round edge & tip to them. This is just another example of the same. This is an example of a baby with GOOD, full shoulders. The shoulders should start at the base of the neck. 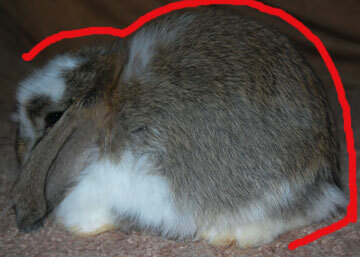 This is an example of a FLAT baby with weak hindquarters, long body and no depth. 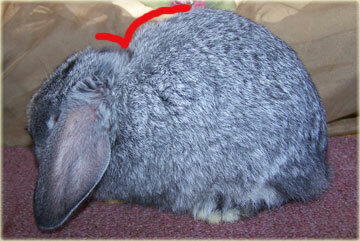 This is another example of a flat baby with a long body. 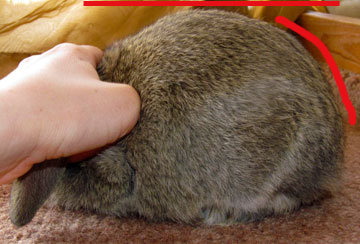 While this baby has a small amount of depth, it is much too flat for an ideal Mini Lop. This is a baby that peaks too soon, which then makes the hindquarters slope off. When I say "peaks too soon", it means that her rise does not gradually go up, but immediately goes up. 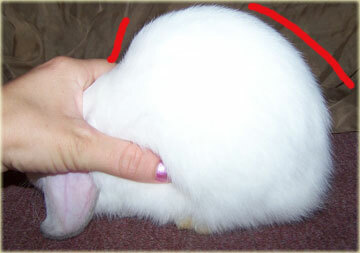 This is a baby that has a flat spot over the hindquarters and flat hindquarters - instead of being full & well rounded. This is a baby with undercut hindquarters. 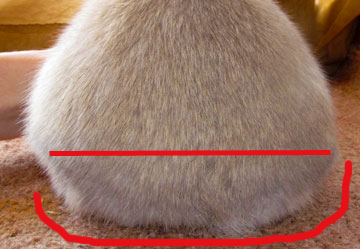 See how there is space at the bottom of it's hindquarters & it does not go fully down to the table? This is a baby that is too long in body. It has nice width, but it's length of body should be shorter. This is a side view of a baby that lacks depth and is long in body. While it has a nice slope with the depth that it does have, it should be much taller. This little doe is another example of a baby that lacks depth. While she may look like she has good depth compared to the baby at left, she is a short bodied doe, who lacks depth. So, it makes her appear like she has better depth, because she is shorter bodied than the baby at left. This is the same baby to the right above, just to show how short in body she is, even though she lacks depth. This is an example of a baby with LONG shoulders. See how far back his rise starts? Typically these babies will also be vary hard to get to sit still for any length of time in a correct pose. 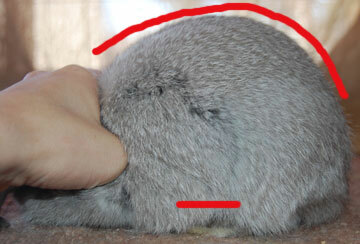 Most of the time, they want to sit upright on their feet, because of the length of their shoulders. This is a baby with LOW shoulders. See the dip between the back of her crown and where her rise starts? Here is another example of a baby with low shoulders, although it might be a little hard to tell in the picture. 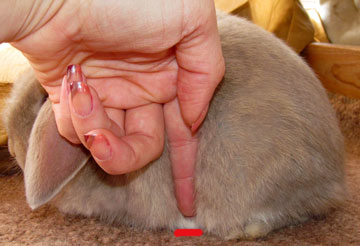 The "finger test" I learned years ago. It helps determine how short or long bodied a baby is. How to do the finger test: Place your finger in the middle of the baby's body - in between the front of the hip and the elbow (right in the midsection). How many fingers you can fit in this space, will show how long or short the baby is. If you can just barely squeeze your finger in or just get 1 finger in between the space mentioned above, the baby is nice & short bodied. This is what I try to have in all the babies I keep. If you can easily fit two fingers into the space mentioned above, the baby is long in body. I rarely ever keep a baby that is long in body like this.